Early in 1868 Thomas Jackson, a young carpenter who lived in Lofthouse, was exploring How Stean Gorge with a friend. Whilst he was scrabbling around in the cave he found a number of silver coins hammered into crevices in the back wall and floor. 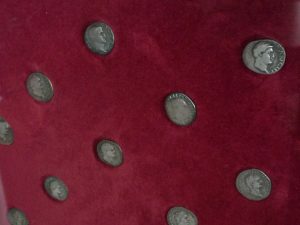 A total of 35 silver Roman Denarius coins from the period CE 54-138 were extracted, and some could only be removed by using a pair of pincers. Although little is known about the extent to which Romans lived and worked in Nidderdale, it appears that they forded the river at Pateley Bridge and evidence of Roman mining comes from three ingots of lead found near Greenhow. Other Roman finds throughout the upper dale include a fibula brooch discovered not far from the Lofthouse Hoard, two querns from Greenhow and a pig of lead also from Greenhow.